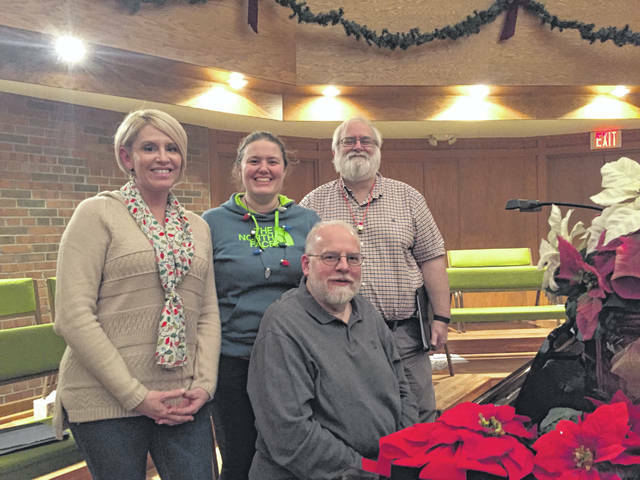 Emily Adams Belcher, Stephanie Miller, Paul Burnside and Brian Hesselbart prepare for the upcoming charity concert benefiting the Delaware community. “Winter at William Street” will be presented at 6:30 p.m. on Sunday, Dec. 2, at the William Street United Methodist Church, 28 W. William St., Delaware. Music is powerful — especially when it helps provide food, clothing and shelter. The “Winter at William Street” concert will take place on Sunday, Dec. 2, with an organ prelude beginning at 6:30 p.m. and the concert starting at 7 p.m. The free Christmas Concert, which will be held at the William Street United Methodist Church, 28 W. William St., Delaware, is open to all, and it also promotes a collection of CDs that have been produced for nine years to help serve the Delaware community. The Christmas CD, which is titled “Winter at William Street,” was first produced in 2009 by Ohio Wesleyan University alums Doug Warnock ’75, Brian Hesselbart ’80 and Paul Burnside ’85. It was made as a response to the recession. At the time, Pastor Julie Carmean spoke to the congregation about the number of impoverished people in Delaware. “What I began to work on was how we could be a church without walls,” Carmean said. Her request was for the members of the church to help fight poverty in the community. Funds generated from the concert and CD sales serve many underfunded needs in the Delaware community and go to Andrew’s House. From there, most of the money helps provide students with free lunches during the summer. In addition, funds offer continued aid for students who have school-subsidized lunches during the school year.